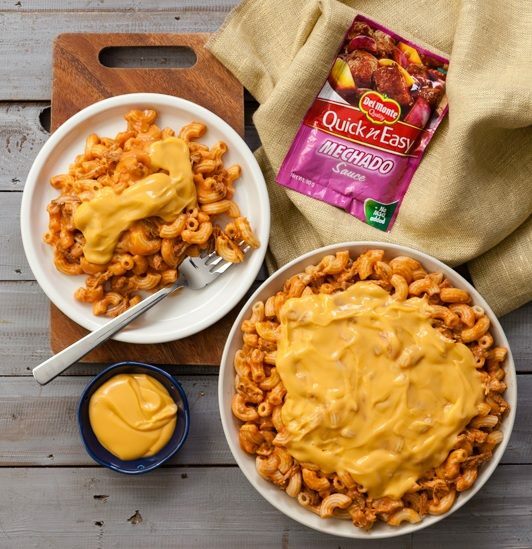 With the Del Monte Quick n’ Easy Mechado Sauce, you can make the hip, modern dish like No-Bake Cheesy Macaroni. Try this dish for a 100% Sure-Sarap dinner. 1. Marinate the beef and pork in soy sauce and garlic for at least 30 minutes. 2. Transfer the marinated meats into a pot and add the onions and mechado sauce. 3. Bring to a boil then simmer in a covered pot until the meat is tender. Stir the mixture once in a while to make sure nothing sticks to the bottom of the pot. 4. Separate the meat from the sauce. 5. Flake the meat with a fork. 6. Heat the remaining sauce in a pot. Add DEL MONTE Cheese sauce and adjust the consistency with water. 7. Toss into cooked DEL MONTE Macaroni Pasta.